With lots of eyes looking at the future of Dorothea Dix Park, there is sure to be new development and plans to help connect it to downtown Raleigh. Between the two, one of the largest such projects announced so far is along Saunders Street so I thought it a great time to walk the area. We’ve talked about a lot of new stuff taking place near the intersection of Saunders and South Streets but going away from downtown, there are buildings and land available for new projects. A local development firm, Five Horizons, plans for something special in the mostly wooded area along the eastern side of Saunders. Residential towers with skyline and park views plus ground-floor restaurants may one day make up this area. See the map below to get an idea of where the group is making plans. Planned development is shown in orange. Click for larger. Roughly nine acres in size, the area is mostly undeveloped with some businesses facing Saunders and the Rocky Branch creek on the northern edge of the property. 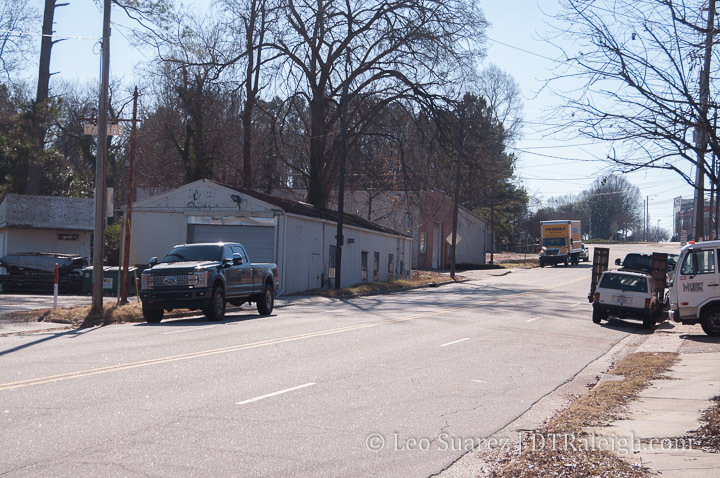 From the intersection of Lake Wheeler to where McDowell Street begins, a series of auto-repair shops and light warehouses line the streets. Some are open, some empty. For this area, the Five Horizons project will create a transformation. 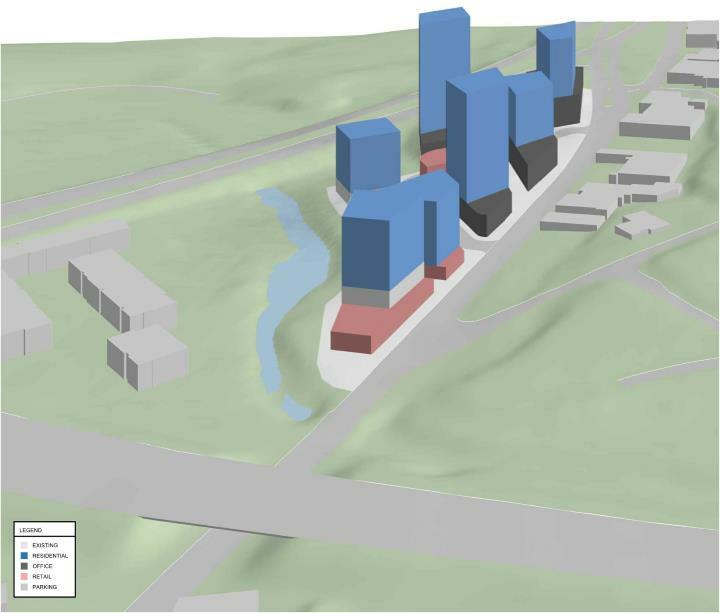 When looking at the currently open rezoning request, the developers are planning for an appropriate zoning that allows buildings between 12 and 20 stories tall with the shortest being in front of the creek. In addition to a new interior public street, the buildings will be laid out so that every floor has a great view by design. This was mentioned several times from the design team at the CAC meeting I attended. Starting with the creek, the developers are looking in to ideas to create a public space, such as a boardwalk, here. Bridges from the new development over the creek to the existing greenway could happen as a way to make the downtown skyline view available to all. Rendering with building massings. Click for larger. The development could have a mix of residential, office, and retail to create activity throughout the day and night. The new street will be planned narrower as a way to create more space for people and make it more walkable. Street and block plan. Click for larger. After presentations and conversations at the CAC over the last few months, the response has been pretty positive towards this project. This month, the CAC has voted in favor of the rezoning for this project. Five Horizons say that they are still years away from starting on the first parcel so I imagine this area will certainly take time to be fully built out. I expect that change may also take place nearby so Saunders could become a new downtown district in the near future. In December 2018, it was announced that a developer had been selected to buy parts of Seaboard Station from the owner, William Peace University. 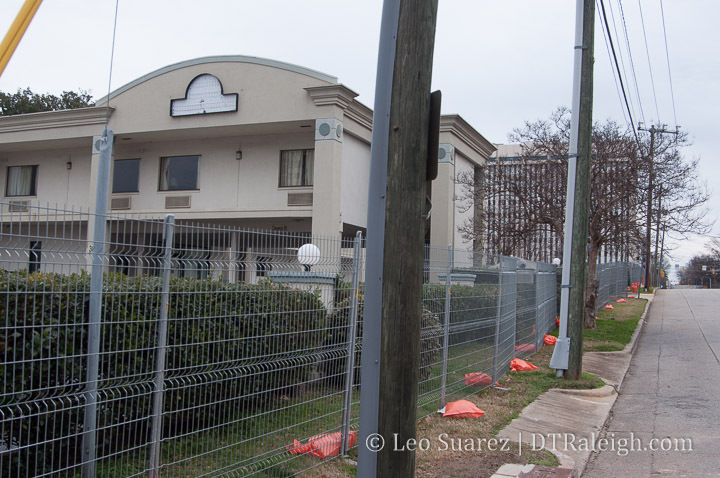 Plans for new development are underway including apartments, hotel space, and more retail. PN Hoffman, the developer of premier urban communities across the Washington Metropolitan Area including the $2.5 billion Washington, DC, waterfront neighborhood The Wharf, along with William Peace University and TradeMark Properties today announced PN Hoffman’s purchase of Seaboard Station in the north end of downtown Raleigh. 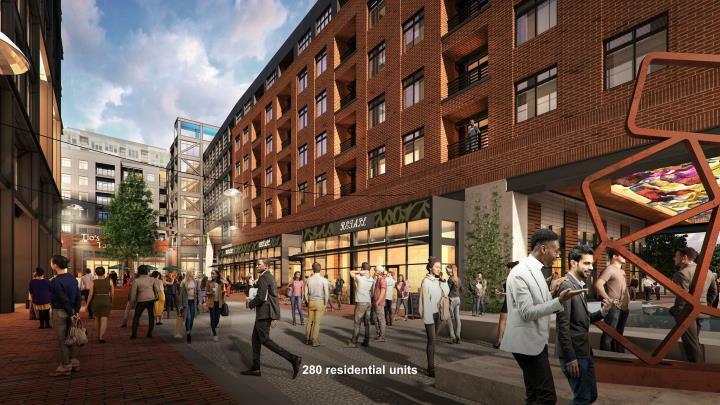 The expansive $250 million project will be built in three phases and consist of approximately 800,000 square feet of mixed-use space at full build-out. With this news, Seaboard Station has the potential to really break out from just a destination but into a district with its own personality. I thought this would be a good time to walk around and grab some photos of the area. If you are not familiar, Seaboard Station consists of a hodge-podge of brick buildings from the 1950s and 1960s with Peace Street acting like the main “frontage” of the area. 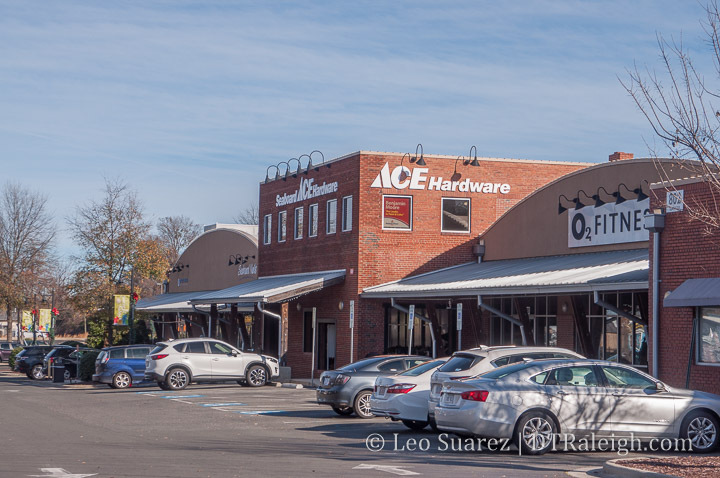 In addition to the former railroad station that now houses Logan‘s, a long-running garden shop, the businesses here make up Seaboard Station and are marketed as a destination. Aerial shot of Seaboard Station from Bing Maps. Click for larger. With the buildings built slowly over time, it’s doubtful that a master plan for the area ever existed so we have a frankenstein-esque retail area that represents the car-centric era that it was built. With a stagnating downtown in the 60s, you can see that no real urban feel exists in Seaboard Station with the development at that time. Bolstered by downtown’s growth and surge of new residents in recent history, Seaboard Station has had a big increase in new tenants. Renovations have brought existing spaces to market but no new space has been built. 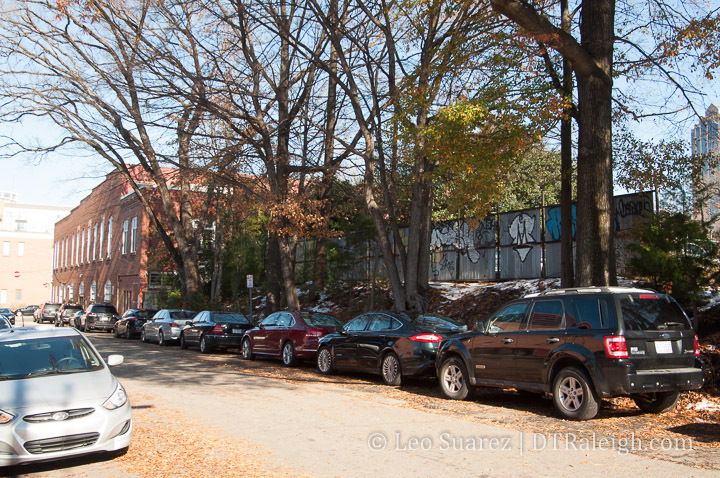 The one-story buildings dominate the landscape here with streets that are awkward to navigate and parking plentiful. There’s no real public space and even gravel parking lots sit empty giving the area a dull, uninteresting feel at times. It’s best to just drive in, get what you want and leave. The potential here though is that all this space can be used for wide sidewalks and plazas. Building upward is almost mandatory. Indeed, the new owners have announced that the first phase of the development will include a hotel. Hotel visitors will want to be able to walk to places so anything nearby within Seaboard Station would be highly considered. In the future, as Peace Street gets its road diet and Smokey Hollow continues to extend Glenwood South closer to Seaboard Station, Peace Street might become a destination street linking both areas together. We’re following Seaboard Station in-depth over on the Community so come join the conversation. Surface parking behind 307 West Martin Street. December 2018. 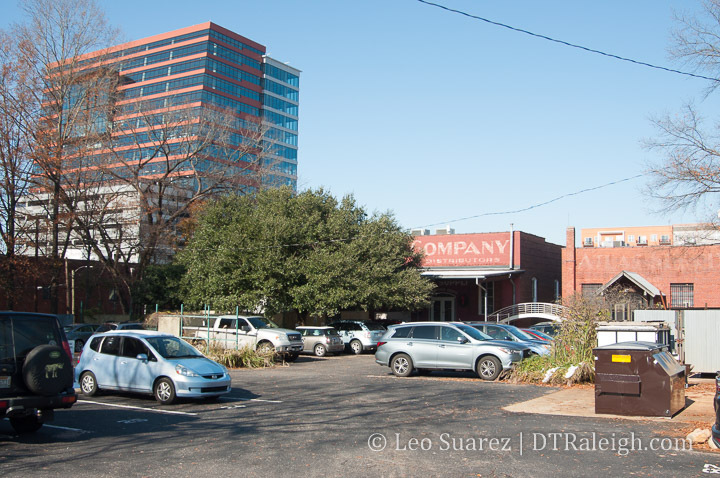 Clearscapes is planning a new building near their properties over in the warehouse district. 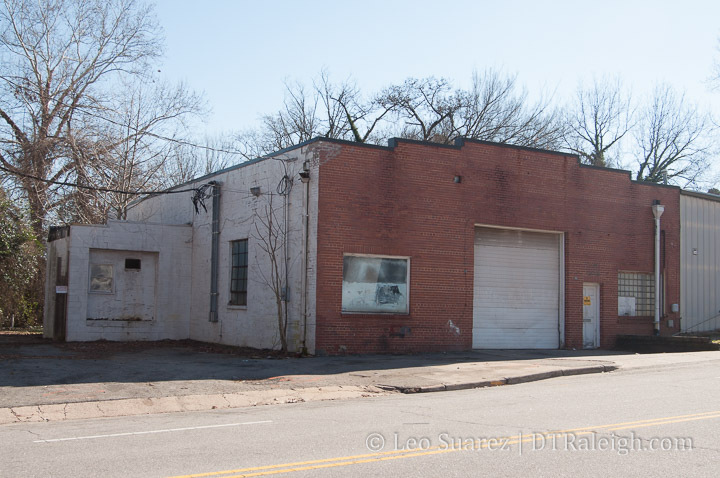 They recently gave a short presentation at a Central CAC meeting about it and while the address of the project includes some of the brick buildings facing Martin Street, the real work will take place on the surface parking lot behind them. 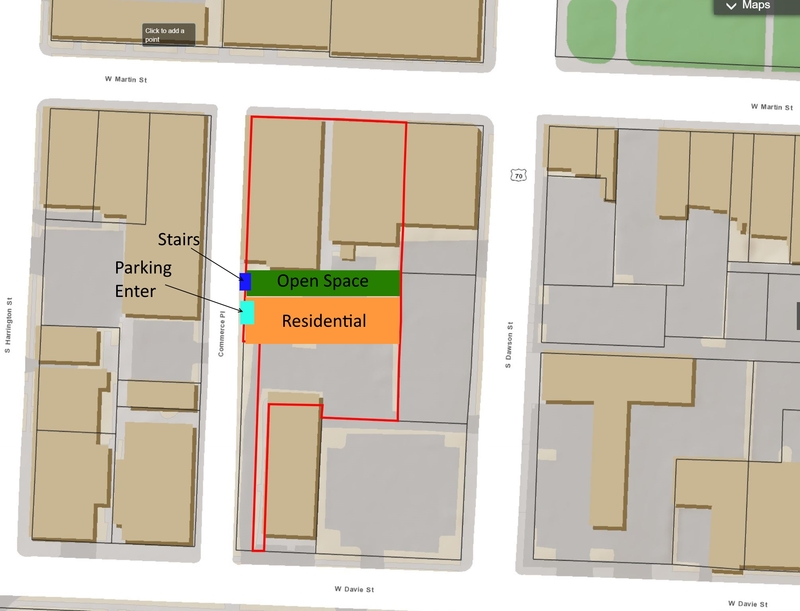 307, 309, 311 and 313 West Martin Street are currently zoned for 5-story development. 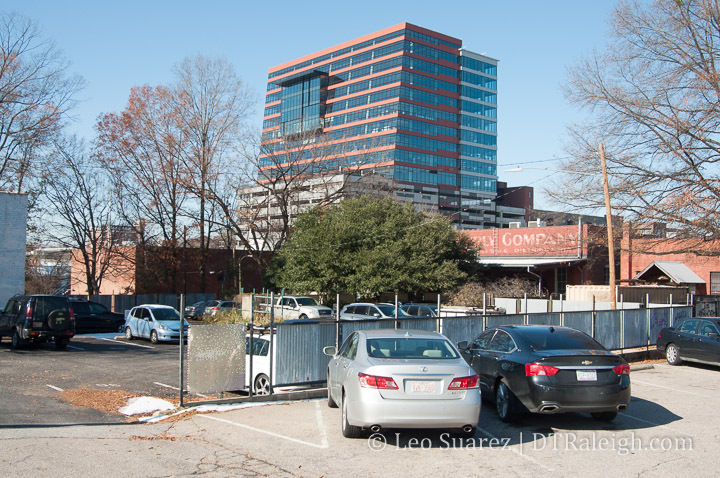 Clearscapes wants to rezone it for 12 in order to bring a residential tower to the parking lot behind the buildings. As I shared on the Community, here is my sketch of the project as well as additional photos to help readers understand the location. 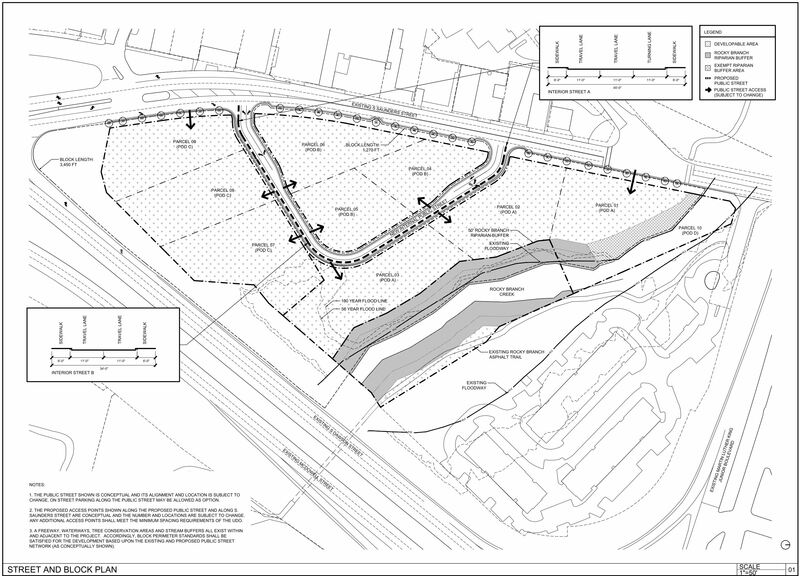 Sketch of the proposed project location. Parking lot behind the 300 block, Martin Street facing buildings. Clearscapes envisions a 10 to 12-story tower with residential units. The first two floors will be parking however the top floor of the parking is actually at the same level of the lot shown above. That means the tower’s parking garage will go underground and that can be done more easily due to how this lot sits above street level. You would enter the garage on Commerce Place, a street that is one-level below the current parking lot behind the buildings. Commerce Place. The Martin Street brick buildings are seen in the left background. Next steps for the project is the rezoning and with Clearscapes’s solid Raleigh reputation, the fact that the Martin Street buildings will be untouched, and only surface parking being removed (private parking by the way) I hope the rezoning goes through smoothly. Rendering of Smokey Hollow Phase 2. Click for larger. While the community actively watches the first phase of Smokey Hollow rise out of the ground along Peace Street, plans for more buildings have been submitted. 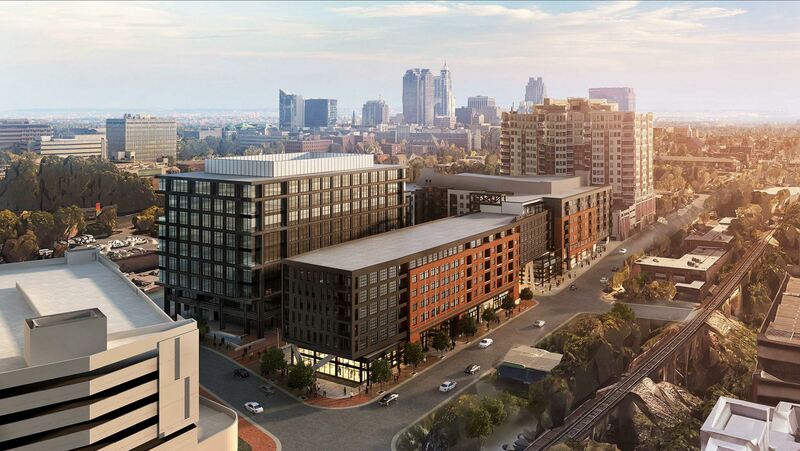 Phase 2 will contain additional buildings along West and Harrington Streets with residential and office components. The rendering above shows the key pieces of the second phase of the three-phase project for the area. With phase 1 (currently under construction) delivering the anchor, a Publix grocery store, phase 2 brings more community and placemaking around it with an office tower, more retail spaces, and overall just a more interesting place to be. It looks like West Street will become a residential street with the addition of a five-story building. The new building will stretch from the West at North tower all the way to the new Johnson Street intersection. Retail spaces will be mixed along West with even more along a new private drive that goes through the development. The “intersection” of Tucker and West will have a private drive that cuts through to Harrington as well as pedestrian-only plaza towards Johnson. Here, more retail and outdoor spaces will be made to create a sense of place. The renderings below will help to visualize the concept. Rendering of Smokey Hollow Phase 2, West Street at Tucker St. Click for larger. 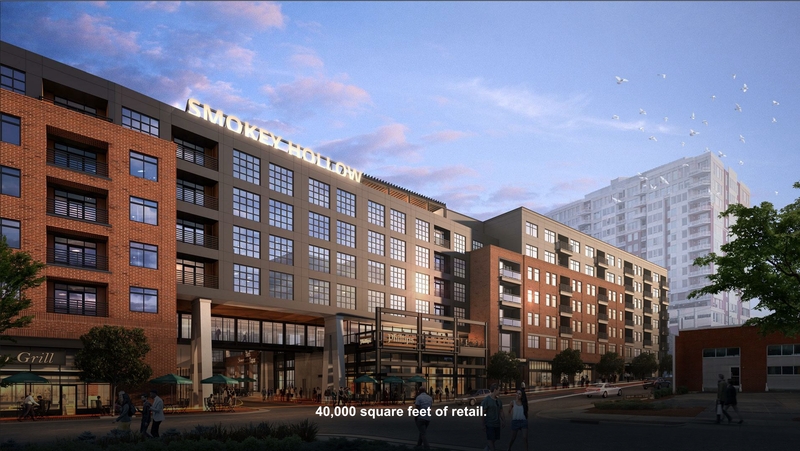 Rendering of Smokey Hollow Phase 2, Retail along the “interior”. Click for larger. All of this should drastically improve the sidewalk experience in the area. 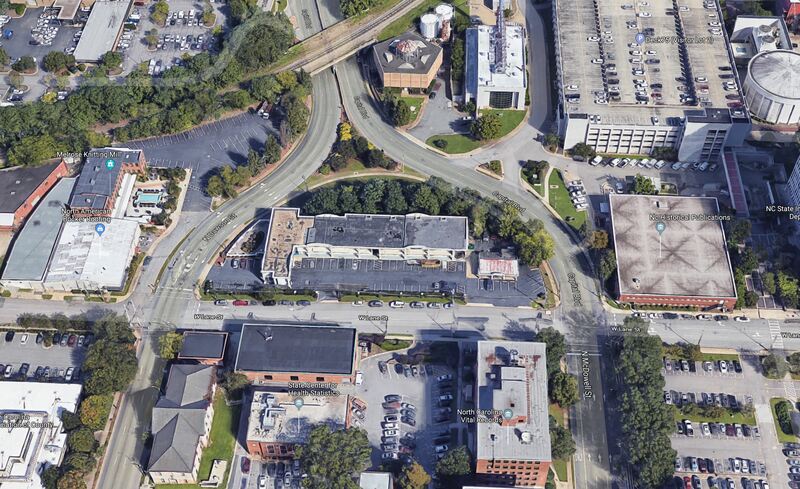 West and Harrington will become two key urban streets, something we’ve discussed before, and Smokey Hollow basically becomes the northern gateway to downtown Raleigh. In the future, as a BRT line goes through this area, the flow of people through it will become more obvious. 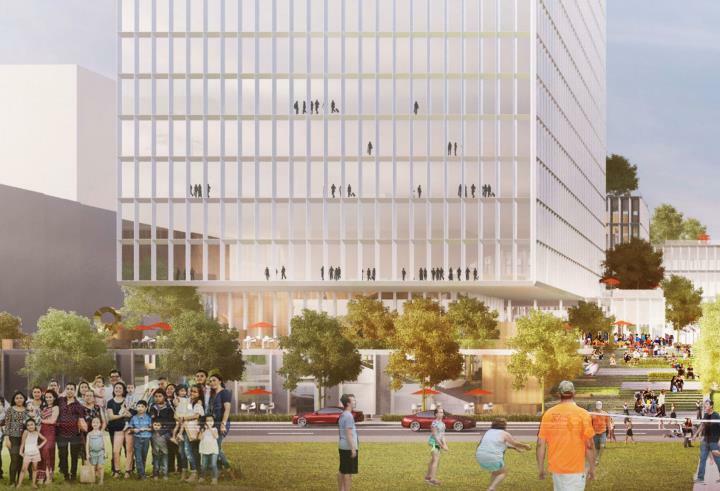 Tightening the fabric between Smokey Hollow and the rest of Glenwood South would really make the area lively and I’m hoping that the office tower does very well. More workers could really bring more streetlife to the daytime hours here and give Glenwood South that 24-7 feel. Mix in the future Devereux Meadow park north of Peace and the area should really take off! More to come on this one for sure! The city has posted the latest version of the master plan for the downtown civic campus. This would involve a significant update to the municipal buildings to the north of Nash Square. Over time, it’s possible that the existing buildings will all be demolished and up to 20-story towers for city workers will be built on this block. 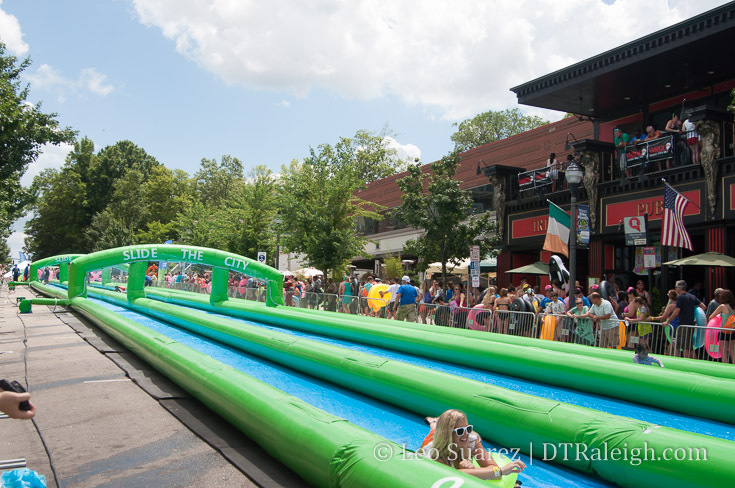 Jump into the plan (pdf doc) here on the city’s website. 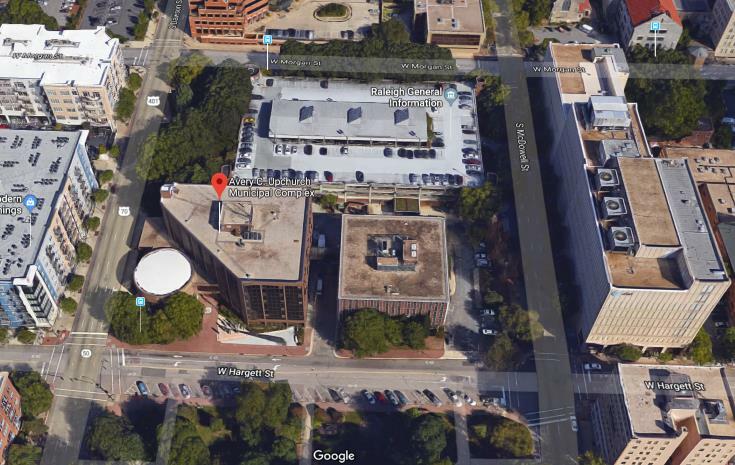 The Avery C. Upchurch block, or municipal block as I’m calling it, consists of the former Raleigh Police Headquarters building, the Raleigh municipal building (RMB) currently in use, and a 3-story parking deck. The police HQ is currently vacant and we’ve outgrown the RMB to the point where extensive maintenance is needed in the next few years. 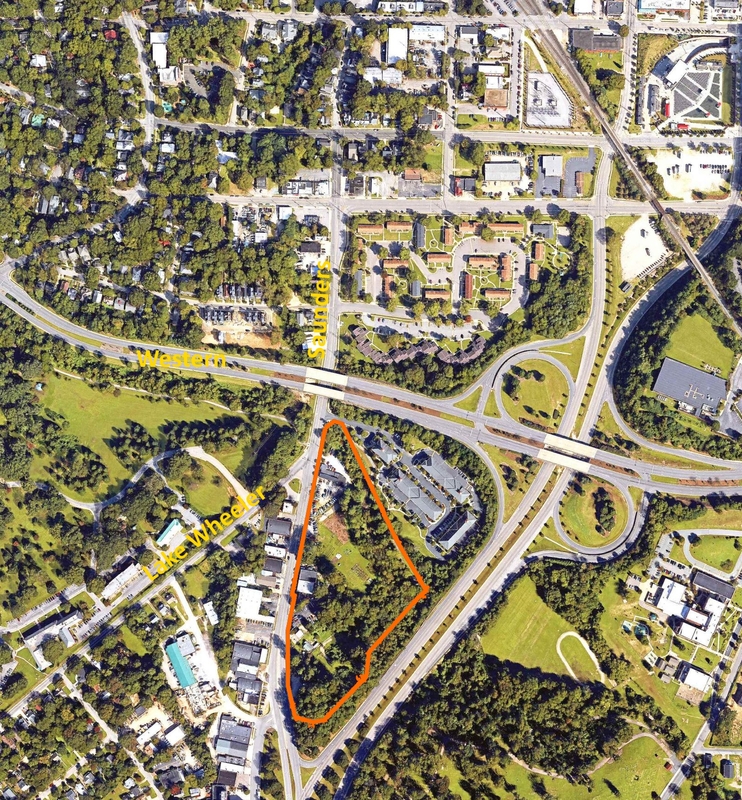 The future Raleigh Civic Campus will be a mixed-use, walkable destination consisting of a New City Hall with public-facing government functions, expanded municipal departmental space, and pedestrian-connected public spaces. 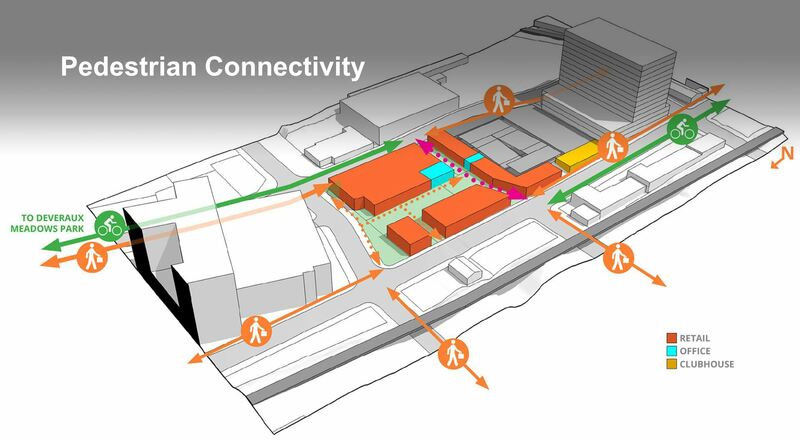 Other land uses may be arranged around the campus, including urban retail, commercial office, housing, and a combination of below-grade and structured parking. The total potential of the Civic Campus is approximately 2.2 million gross square feet, excluding underground parking and services. The full build-out of the campus is dependent upon the execution of several capital projects over three phases and employing a suite of delivery methods, including City-owned and managed development, private capital-led development, and potentially a collaborative public-private partnership. Phase 1 – The East Building: Demolish the Police HQ and build a 20-story office tower for approximately 1,400 staff, public-facing functions, and Council Chambers, as well as potential ground floor retail. Phase 2 – The West Building: Demolish the RMB and tentatively plan for an up to 20-story office tower, the twin to the East Building. A public plaza between the two towers will tie the two sites together. 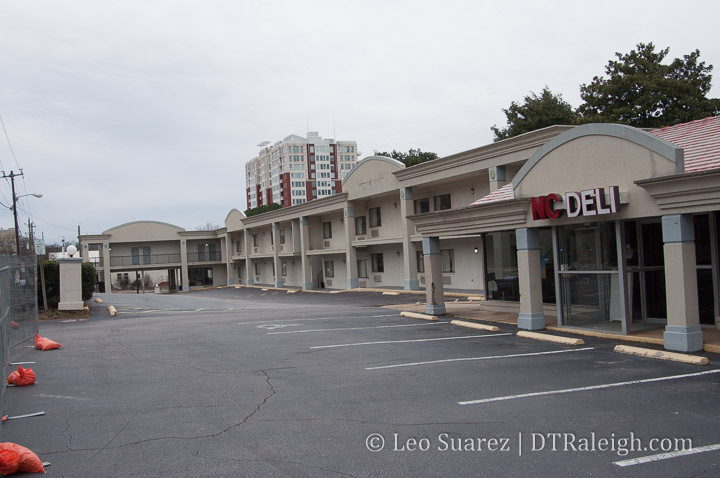 Phase 3 – Mixed-Use Development: Demolish the municipal parking deck and allow for up to 20-story private development. The additional space on this campus will be for current workers who are spread across downtown as well as new hires in the future. The civic campus aims to consolidate offices and bring together departments as a way to make the campus more secure and more customer-friendly in a cost-conscious manner. The master plan lays out the costs of doing nothing and just maintaining buildings and the difference is in the tens of millions of dollars. See page 18 for more details. As each department continues to grow, accommodation of the City’s expanding workforce in an organized and fiscally responsible manner will become increasingly difficult. City staff has conservatively estimated the need to invest more than $245 Million (in today’s dollars) over the next 30 years just to maintain the status quo. 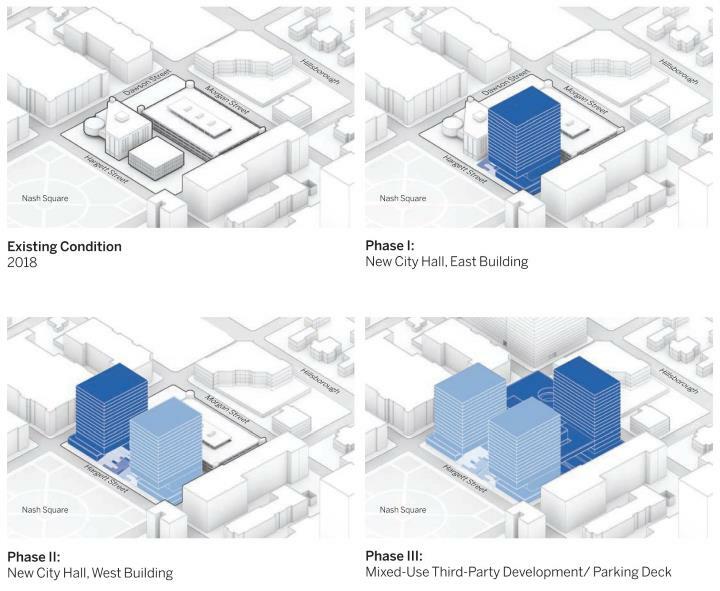 The master plan really focuses on delivering the needs of the city for the next 30-40 years between these two towers, the East Building, and West Building. (Phases 1 and 2) Mixed-use development through collaboration with a private developer for phase 3 isn’t quite set in stone, which makes sense. It’s a good opportunity to provide something that’s needed on the northern end of the block such as housing or hospitality but those needs haven’t been identified just yet. There’s plenty of opportunities to build as the entire block is zoned DX-20-SH, or downtown mixed-use with a 20-story height limit, shopfront design. This is significantly mroe dense than what we have today. With a much larger presence here on the municipal block, the civic campus becomes a destination and should help connect downtown districts. 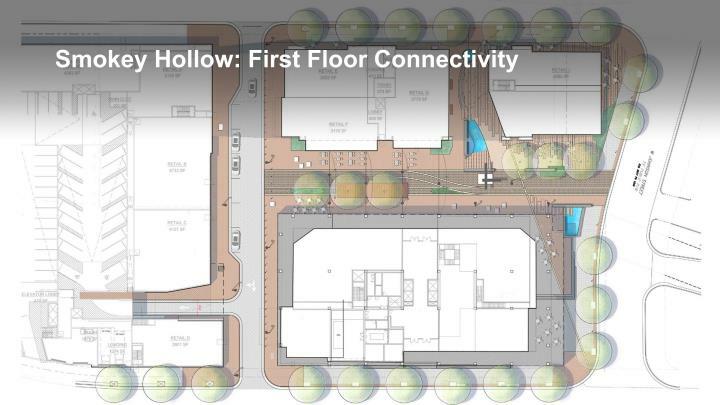 This is touched on more in the master plan where the design team has thought about connecting it along the east-west streets of Morgan and Hargett from the Warehouse District to Fayetteville Street. 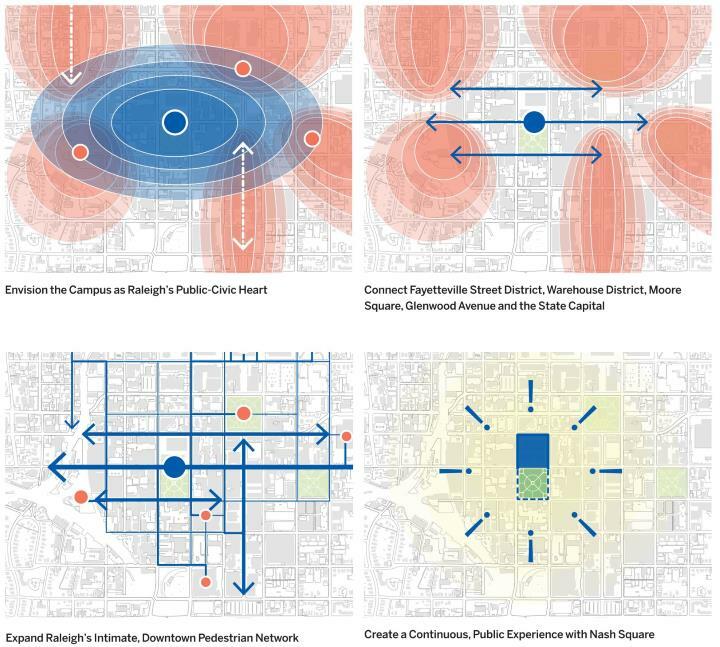 Nash Square should not feel isolated from the campus but rather become an extension. This makes pedestrians number one along Hargett Street and the public plaza must emphasize that. 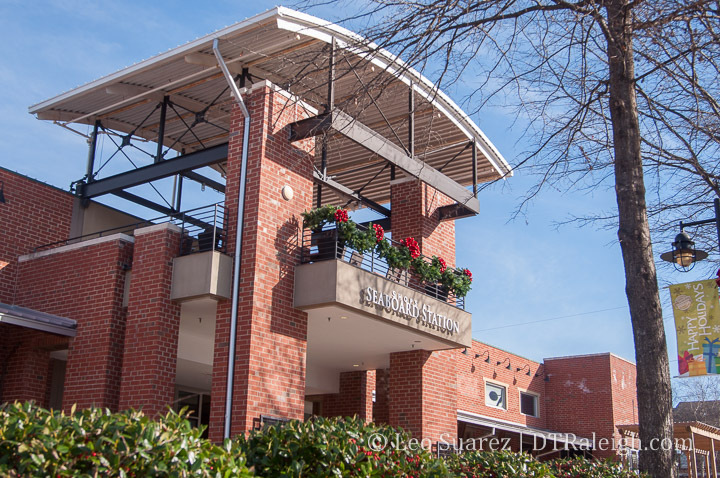 Taking cues from the 2015 Downtown Plan, this vision supports Hargett Street having an attractive and livelier streetscape. The master plan continues with details about a central gathering space and plaza within the site and possible uses for the mixed-use portion on the northern half. The examples from other cities are helpful in visualizing what is possible so I encourage readers to check it out. I’m very happy with what’s in this master plan and feel it’s got all the right elements put together for this area. In my opinion, some points really need to be hammered home once the city gets into the details. 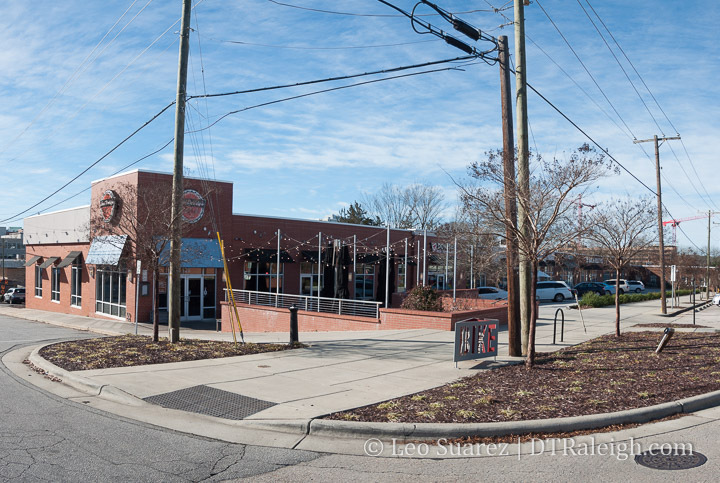 I would want to really emphasize the need to make the municipal buildings along Hargett welcoming and engaged with the sidewalk rather than being stale, public buildings. I’d love to see Hargett Street get the “City Plaza” treatment. Between the East and West buildings and Nash Square, let’s create an even street separated with bollards (trees?) where pedestrians and vehicles are on an equal plane. Transparency through the ground-floor of these sites all the way to Nash Square might just give you that park-like feeling even if you’re a block away. 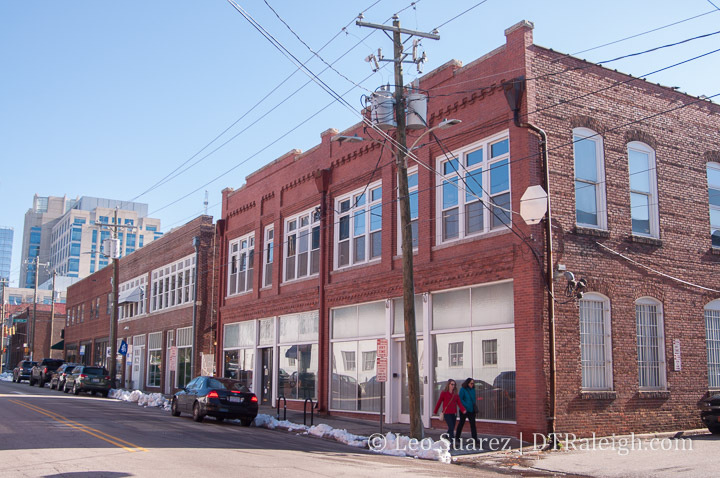 Retail spaces along Hargett should be plentiful since there is only space on one side. I’d like to see the city take a less traditional approach to it also. For example, businesses may not be clamoring for space here right away so as spaces are empty, pop-up concepts should be welcomed. 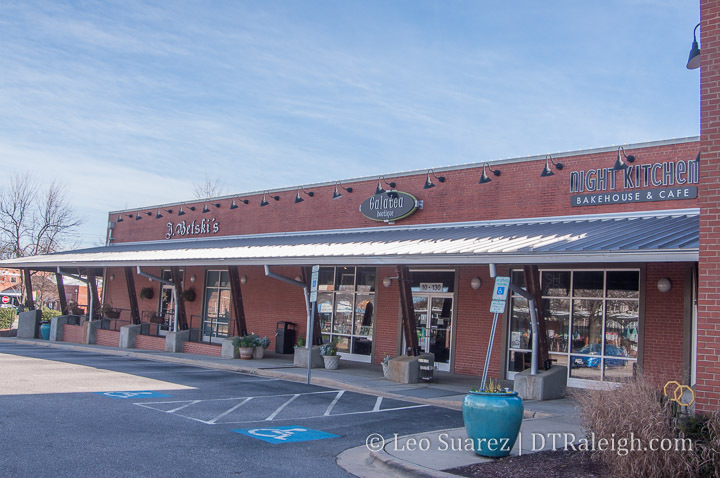 That approach can help new businesses kickstart themselves and down the road, move on to a more established home nearby or elsewhere in Raleigh. With phase 3 being so far out, it’s probably best to comment on that piece down the road. This project will be fun to watch and I’m hoping for something that Raleigh can be proud of. 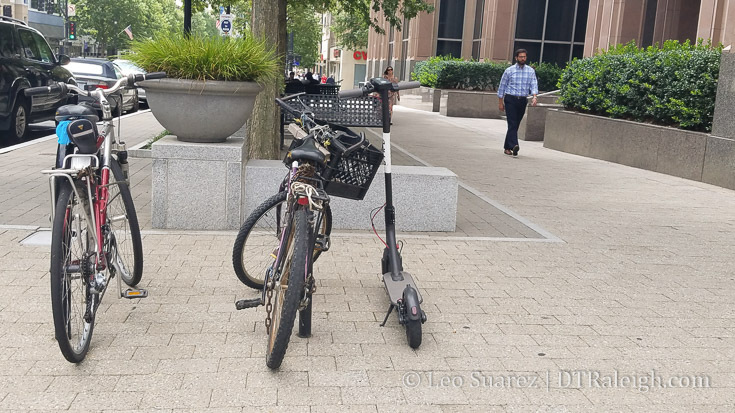 Ever since the electric scooter company, Bird, deployed in Raleigh everyone seems to have an opinion on this new form of personal mobility. Raleighites seem to be all over the spectrum but a recent survey run by the Raleigh DLA shows strong evidence that a majority of downtown residents and workers support e-scooters in downtown Raleigh but with some type of new regulation. You can dive into those results here. 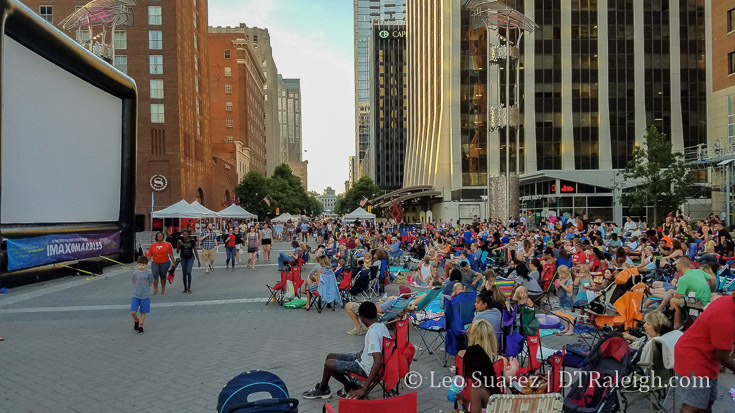 Mobility within Raleigh’s downtown has seen so much change since this whole revitalization thing started. I wonder if we’re getting closer to getting it right or still struggling with it. Downtown Raleigh is too small to drive from one place to another yet big enough that walking from district to district feels far. (at least for most people I think) This presents a great opportunity for short-trip mobility services such as bikeshare, electric scooters, rickshaws, rideshare, and the R-Line circulator. Personally, I love the plethora of options to move around. If I need to get from Seaboard Station to the southern end of Fayetteville Street, I could easily walk if it’s a nice day and I have the time, ride the R-Line for free and get there a little faster, ride a scooter for cheap and get there even faster, or request a ride in a car and be there quickly. My impression of Raleigh right now is that no one is against having options. What the DLA survey suggests is that problems are arising when these options are conflicting with each other. It seems we have a city built for two speeds with a third speed emerging as a popular option and this new speed is struggling to find it’s space. Generally speaking, pedestrians are annoyed by scooters on the sidewalk. Sure, it’s illegal and Bird informs users to use the street, a bike lane if available, but personal comfort levels vary widely. Not everyone is comfortable on the street so the sidewalk is a natural “safe” place. You become the dominant user on the sidewalk versus the pushover on the street. The quick adoption of scooters in downtown Raleigh is what bicycle advocates have been waiting for. It’s brought the conversation for safer streets for middle speed users front and center. How our city responds will be telling as trends point to more and more of this coming. The day of the bike lane is over. It needs a new name. There’s lot of chatter about dockless scooter in Raleigh on the DTRaleigh Community.